I LOVE LOVE LOVE the Vivid Lacquer plates too. 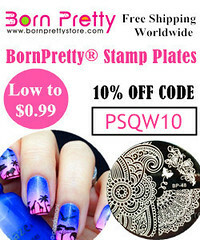 Your stamping turned out really pretty. I did the houndstooth last night and it’s absolutely perfect! I’ve never heard of vivid plates!!! I want some! It looks like this stamp is in french? so cute. Wow, this looks great! I LOVE the writing stamp and it really looks fab with Natty!